Loved the bunny and thought s/he looked lonely without a companion. 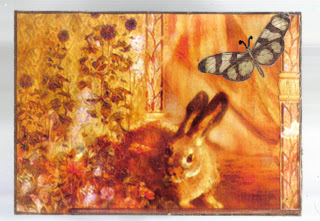 The butterfly, although much larger in scale to the bunny, provides the needed friendship. All images are from various magazines. I really love the colors in this one. Really a nice piece. I think the scale of the butterfly and bunny draw you into the owrk! I think that this is my favorite ATC that you have made. It is beautiful. What a gorgeous ATC!! Love it! !